You have always dreamed of popping those balloons that you see flying off into oblivion. Now you have a chance to own this dream. Help the planet by not letting these balloons fly off into the stratosphere. Lets face it, popping a seemingly infinite onslaught of balloons is just what you’ve been looking for. 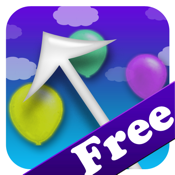 Real world physics will lift your spirits as you destroy the balloons level by level. Realistic weather effects like rain, snow and more. Ton of achievements to unlock and global leader boards will keep you playing for hours. Awesome graphic and audio effects. Next installment will offer even more levels and more variety of obstacles.